Amandla Stenberg is a teenager who becomes an unwitting figure in a police brutality trial in the provocative YA adaptation The Hate U Give. 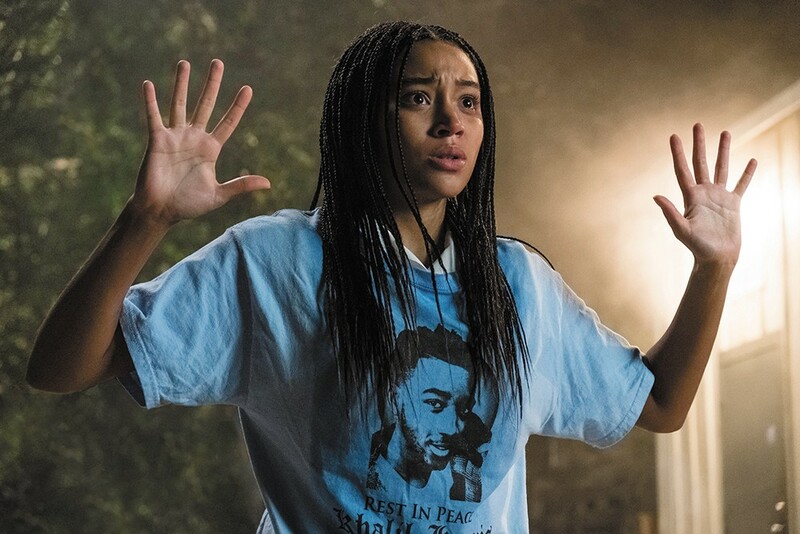 Based on a very popular 2017 young adult novel by Angie Thomas, The Hate U Give takes a bit of a simplified approach to its controversial subject matter, but that streamlined focus allows the movie to emphasize what's most important to its characters and its audience. The opening scene offers a powerful distillation of the way that black people in the U.S. interact with the police, as father and former gang member Maverick Carter (Russell Hornsby) explains to his young children how they must behave if they're ever stopped by a police officer. Years later, teenager Starr (Amandla Stenberg) takes that lesson to heart when she and her childhood friend Khalil (Algee Smith) get pulled over on a thin pretext. Khalil is less cautious, though, and he ends up dead after a skittish officer shoots him for brandishing what turns out to be a hair brush. Khalil's death becomes a divisive issue in the Carter family's fictional Garden Heights neighborhood and in the surrounding city, and Starr finds herself caught in the middle, urged by some (including an activist lawyer played by Insecure's Issa Rae) to go public with her story of witnessing Khalil's shooting, and more forcefully encouraged by others (led by a local drug kingpin played by Anthony Mackie) to keep quiet. Even before the shooting, Starr has been living in two worlds, one at home with her family and the other at the mostly white prep school across town where her parents send her and her brother in order to provide them better opportunities in life. There, Starr has a well meaning but clueless white boyfriend (played by Riverdale's K.J. Apa) and a pair of white BFFs who are not entirely sensitive to complex racial issues. Starr has a strong home life with her father and mother (Regina Hall) and two younger siblings, but the neighborhood remains under the shadow of Mackie's King and his drug-slinging crew. Director George Tillman Jr. and screenwriter Audrey Wells make Starr's conflicted emotions over speaking out feel real and immediate, and the incident itself is such a clear injustice that the message about the abuse of police power comes through strongly. The various subplots in the sometimes meandering movie don't work as well; Starr's relationships with her upscale classmates are thinly sketched, and Apa seems like he's still stuck in a CW teen soap as Starr's boyfriend Chris. King, too, is a pretty one-dimensional character, and Mackie spends most of the movie glowering at people from behind car windows. The story gets stretched thin by trying to cover all conceivable angles (Starr also has an uncle, played by Common, who's a police officer), and the message can end up diluted at times when it should be the most forceful. Stenberg holds it all together as Starr, though, making her a believable teen with superficial concerns about prom and popularity that compete for attention with her hunger for justice. After a strong turn in last year's Everything, Everything, another socially conscious YA adaptation, Stenberg gets an even better platform for her talents here, with a vibrant story that matches her passionate performance. Hornsby and Hall are both very good as well, portraying parents with different, sometimes contradictory outlooks on life but equal commitment to their children. The original print version of this article was headlined "Taking a stand"
The Hate U Give is not showing in any theaters in the area.